CaribPR Wire, Mon. Sept. 15, 2014: Why do multinational companies choose Trinidad and Tobago? ; What is Trinidad and Tobago doing to attract FDI outside of a thriving energy sector? ; What is the future of US / Trinidad and Tobago relations? These questions will be answered on September 25, 2014 in New York at the Trinidad and Tobago Investment Conference. This premier event will feature the Honorable Prime Minister, Mrs. Kamla Persad-Bissessar at the headquarters of the Council on Foreign Relations, 58 E 68th Street, New York, NY. Trinidad and Tobago is ranked #1 for cost effectiveness in the Caribbean and Central America (fDi Intelligence, 2013) and boasts of a strategic location below the hurricane belt, which augers well for bulk trans-shipment, fewer business disruptions and uninterrupted power. Strong trade relations with USA, Canada, Costa Rica, Venezuela, CARICOM, Colombia and Europe provide local businesses with easy market access to over 1 billion consumers globally. The conference will focus on Trinidad & Tobago’s competitive advantages as a business location. It will include panels of experts and business leaders from Trinidad & Tobago and the United States to discuss the country’s advancements in economic diversification, foreign investment, foreign policy, energy, competitiveness and innovation. Senator the Honourable Vasant Bharath – Minister of Trade, Industry, Investment and Communications. Senator Dr. the Honourable Bhoendradatt Tewarie – Minister of Planning and Sustainable Development. Senator the Honourable Kevin Ramnarine – Minister of Energy and Energy Affairs. The media is invited to cover this event and arrange interviews through InvesTT Trinidad and Tobago, the national investment promotion agency. InvesTT Trinidad and Tobago is an integral part of the Government’s diversification strategy and serves as the first point of contact for investors seeking opportunities in all of the country’s targeted sectors. The company provides full service facilitation for all incoming investment projects. InvesTT representatives Mrs. Racquel Moses, President and Mr. Shyamal Chandradathsingh – Vice President, Investor Sourcing will be there to meet with interested parties. For more information on Trinidad and Tobago’s investment offerings visit www.investt.co.tt. That’s the word from the twin-island Republic’s Minister of Trade, Industry, Investment and Communications, Senator Vasant Bharath, who put the spotlight on his country at the 2014 Invest Caribbean Now summit in New York City on June 4th. Bharath said his country has cut the time to start a business from 43 days to three days and sliced the verification of address process to 24 hours as part of its “Easy doing Business” initiative. Trinidad & Tobago has also sought to diversify away from oil and gas, growing its financial services, agro-business and creative sectors, Minister Bharath told delegates who included representatives from Merrill Lynch, the World Bank Group; Goldman Sachs, OPIC; Sandals Resorts International; DHL Caribbean, HBO Latin America, One Caribbean Television, First Citizens TT, InvesTT, interCaribbean Airways; Bright Capital; Aegis Capital; Medici Group, Adiuvo Partners LLP, The Lugano Group, The Woody Wilson Fine Clothing of Beverly Hills; Global Med Choices, American World Clinic; Aspenall Energies; MPowered, Sir Richard Branson’s, Carbon War Room; The Goodness Compan, China Daily USA; Caribbean Commerce Magazine; NATCOM International, One Caribbean Television, FlyingICU, GeoTechVision, Auto Planet Japan Ltd., Super Green Solutions, Cayman Islands Department of Tourism, Invest Saint Lucia, K&L Gates, Lu Ning Architecture, New Sports Group, The Pont Group, Damoola Inc., the Chinese American Business Development Center, The Sino-American Friendship Association and the Russian-American Chamber of Commerce. He revealed that his country’s reserves have doubled to $5 billion and unemployment has declined to five percent. A bond offering in London last year was oversubscribed by a multiple of 10. Four hundred foreign firms operate in the country, including Microsoft, General Electric and BP, using Trinidad as regional headquarters. Location on “Brazil’s doorstep” means that the government is diversifying beyond oil and gas and is now pursuing financial services, tourism and maritime services. A 700-acre economic zone is also being developed. “It can’t be done incrementally. It has to be transformation,” Bharath told other Caribbean ministers and U.S. and Chinese political representatives including Dr. Ma Lin, Deputy Secretary-General of the Beijing Municipal Government; Premier of the island of Nevis; Vance Amory; Minister of Tourism And International Transport, St. Kitts, Senator Ricky Skerritt; Minister of Tourism, St. Martin, Jeanne Rogers-Vanderpool; Chairman of the Caribbean Tourism Organization and Commissioner of Tourism, USVI Department of Tourism, Beverly Nicholson Doty; Chairman of the CARICOM Consular Corps of NY and Deputy Consul General, Antigua & Barbuda, Omyma David; Consul General of St. Lucia to New York, Julian DuBois; Claire McLeveighn, Vice President, Trade and Investment International Division, at the Empire State Development Corporation and Assemblyman Carmelo Garcia representing the 33rd District of Hoboken, Jersey City, Union City and Weehawken in New Jersey. ICN 2014 also included several panel discussions including on ‘Global Trends & The Caribbean;’ ‘Beijing-Caribbean Tourism And Investment Opportunity;’ ‘Introducing The New Trend In Tourism – Medical Tourism;’ ‘Introducing A New Trend In The Caribbean – Clean Energy’ and the Caribbean Diaspora as a source of investment. 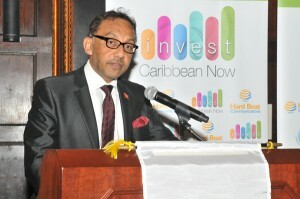 Additionally, the first half of the event included an opening address by ICN founder and chairman, Felicia J. Persaud; a keynote address by Harvard graduate Dr. Isaac J. Newton, of Paramount Communications Consultancy; an investment announcement on the Caribbean Market Village of St. Lucia and a focus on ‘Advancing Wealth In The Caribbean With Technology,’ from Trinidad-born, LA resident, Anthony Wellington Phills, branding specialist of Disney’s ‘Million Dollar Arm’ and founder of Caribbean Commerce Magazine/Media, Calypso Cloud and Blinglet Inc.
See photos from the event here.